La-La Land Records and Sony Music proudly present the expanded, 2CD presentation of legendary composer Jerry Goldsmith's (PATTON, THE OMEN, BASIC INSTINCT) powerful orchestral score to the 1995 Columbia Pictures feature film FIRST KNIGHT, starring Sean Connery, Richard Gere and Julia Ormond, directed by Jerry Zucker. 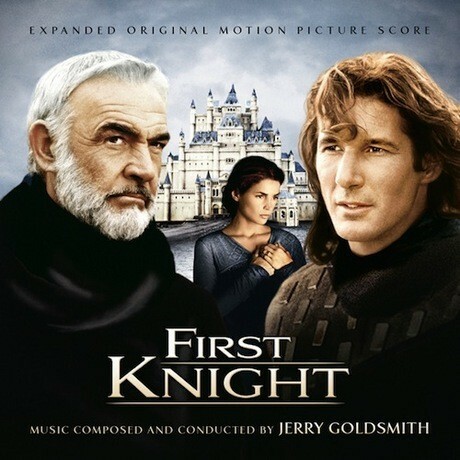 Considered by many, including the maestro himself, to be one of Goldsmith's finest scores, this important work, (presented in its film version for the first time), has been expanded over the original soundtrack release by more than a full hour, including additional alternate tracks. The original 1995 soundtrack release is also presented here, remastered. Produced by Bruce Botnick, Mike Matessino and Didier C. Deutsch, and mastered by Bruce Botnick from Mr. Botnick's own 1st generation digital masters straight from the mixing board, this limited edition release is the definitive presentation of this masterful Goldsmith score. Exclusive, in-depth liner notes are by film music writer Jeff Bond, with additional comments from Bruce Botnick. This is a limited edition release of 5000 Units.